The pair, who competed in this year's Britain's Got Talent finals and were famously egged by one of their own backing singers, are to release their version of I Saw Three Ships Come Sailing In (On Christmas Day). 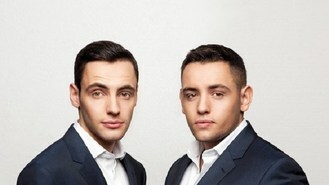 The brothers - Richard and Adam Johnson - are the latest to enter the running and join choirboy Jack Topping who announced he was to release a single, Tomorrow, in time for the festive market. Richard And Adam, whose single is out on December 15, are placed at 8/1 by bookmaker William Hill behind 11-year-old Jack on 6/1, but favourite at evens is the yet-to-be-decided winner of this year's X Factor. They are also to release a seasonal selection of tunes called The Christmas Album, the follow-up to The Impossible Dream which topped the album chart for four weeks.